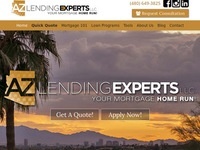 AZ Lending Experts is the premier source for all of your Arizona mortgage lending needs. We are a full service mortgage company specializing in Conventional home loans, VA, FHA home loans, USDA and Jumbo residential mortgages. As one of Arizona's top mortgage brokers, AZ Lending Experts has greater control over your transaction and is able to quickly approve and close loans. In many cases, we are able to fund loans that other lenders might deny. There are always several mortgage options available, and comparing all of them can be confusing. Your new mortgage is an important long-term decision, and without an honest mortgage expert acting on your behalf, you could be stuck in a very bad situation for a long time. We take the time to carefully listen to you and understand your goals, and then provide a consultative approach to helping you find the right loan. That's why we offer a vast array of loan programs that most other lenders can't match. It's all about finding the right loan for you. We offer a variety of home loan solutions including Phoenix first-time homebuyer programs with down-payment assistance, FHA and VA, conventional, jumbo and super jumbo, reverse mortgages and more! This means you can rest assured that we'll provide you with a competitive loan that meets your unique needs. Our rates are among the best in the industry because we have developed excellent relationships with both wholesale and national lenders that want to compete for our client's loan. Our cutting-edge proprietary pricing technology instantly shops each specific loan scenario with each of these different banks to locate the mortgage program offering the best rate and lowest fees. As an AZ Preferred Mortgage Broker, we provide pre-qualifications and mortgage rate quotes at no obligation or upfront cost. We understand the challenges faced in seeking a Home Purchase Loan or Refinancing your Arizona Mortgage, and clear, ethical and honest communication is at the cornerstone of our business.